Big Brother Canada 5 continues to impress but tonight we sadly say goodbye to Bruno Ielo, one of The Mastermind‘s favourite Big Brother players and one of the more capable players inside of the house this season. Let’s get right into divulging all the information on how it all went down. We all knew what was going to happen judging by the way last episode ended, Kevin was going to be saved by William’s secret veto. But we were still all left wondering who that replacement nominee was going to be. 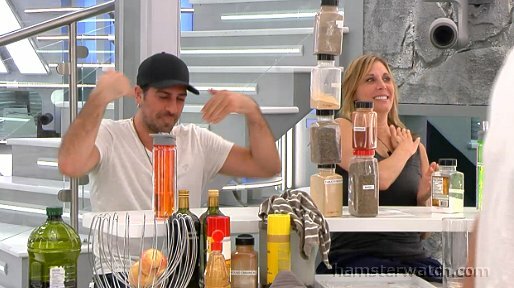 Surprisingly, Demetres decided to nominate Karen. This is her first time on the block and it’s all thanks to that secret veto, something that only she was aware would come into play. Immediately, Demetres pulled Karen aside to try and do damage control. The Greek declared that the only reason he nominated Karen was because she would be certain to stay. Yet somehow, Karen had the false belief that she would be evicted unanimously! This led her to starting to lose her mind. Meanwhile, William played it off to the rest of the house as if it wasn’t him who saved Kevin. Jackie and Kevin were the two other possible culprits who were being interrogated and both of them denied it. Still, the French Canadian played it off pretty well but you have to think that some people must be on to him, especially given that Karen saw him come out of the wall. After a while however, William told the poker player that it had been him who used the secret veto. I thought that this was also a smart move from William. Kevin was already going to be indebted to him regardless but now with the eviction of Bruno he has virtually no one else to help him out and showing Kevin that he’s willing to fight for him means that the poker player should be able to return the favour at a later date. Karen is a little kooky. It’s normal for her and it is part of what makes her an interesting character on the show. But after being put on the block she went absolutely insane. For one she thought she was going to go home which was entirely false as evidenced by that 5-1 vote. For another, she started cussing out everyone in her wake, specifically Kevin. She was just out of control, telling the poker player that he was stupid, before telling him to “go f himself” and a whole bunch of other nasty things for no reason at all. Kevin was just lying down, making pleasant conversation when Karen started attacking him for no reason. It was reminiscent of Debbie Wanner exploding at Brad Culpepper earlier this season in Survivor and if Karen were to show this kind of side of her again, she’ll suffer the exact same fate the Survivor player did. While Karen continued to explode, the others bonded over how impossibly annoying she was. Suddenly, Bruno was looking like he might have some votes to stay! Ika really wanted to keep him around while Dre also mentioned her desire to send Karen home. So why the votes couldn’t come together really is a bit of a mystery. Obviously Bruno is the bigger threat and his partnership with Kevin needed to be broken up, but if people wanted to keep him around and send Karen home instead, then it is a bit of a mystery why it didn’t end up happening. After a hard-fought week and a late switch up of the nominations, Bruno was evicted by a vote of 5-1. This really left me wishing William just used both vetoes and made a big move that he could actually point to as a reason why he should win the game. At the moment, William has a tough road ahead of him and keeping Bruno and Kevin both would have certainly benefited him in the long-run. Unfortunately for Bruno, the moment Sindy made that terrible decision to nominate Neda for eviction, effectively sending her home, his game was screwed just like the rest of them in that four person alliance. If Kevin doesn’t win power you can almost bet that he’ll be gone next, making this possibly the worst Big Brother Canada move in the history of the show. You make one split second decision and the next thing you know you and your allies are the next four people voted out of the house. Does it get any worse? Then after explaining the rules of the HOH Competition, Arisa announced that next Thursday is a triple eviction, which almost ensures that Kevin will be going home. Why? Because how on earth does Kevin Martin survive a triple eviction? In Big Brother Canada 3, Kevin was playing a solid game and hadn’t even been nominated for eviction until the night of the triple eviction. Suddenly, he was evicted in 9th place without even a single vote tossed his way to stay. I see the exact same fate for him this time around as unless he wins that second HOH, he’ll be gone. Even if he wins the first HOH that is being played tonight, he’ll be gone as well as he’ll be unable to play for the HOH that really matters. I virtually just see no way around a triple eviction for Kevin this season and unless he wins that second HOH, he’ll be screwed over by the twist just like he was in his original season. Nonetheless, I do think Kevin has played a slightly better game this time around and whatever happens in that triple eviction it is sure to be entertaining and The Mastermind cannot wait to cover it with you all week long. This episode was a whole lot of fun just as the entire season has been. Although it marked the sad day of the eviction of Bruno Ielo, this was still a highly entertaining episode and week for that matter inside of the BBCAN Odyssey. And with a triple eviction, next week could be even better! I cannot wait to cover it all for you right here! See you soon!